Bellona.org > Latest News > Nuclear issues > Nuclear Russia > Does Russia need floating nuclear power plants? Recently, Russia’s state nuclear corporation Rosatom has initiated activites for the construction of floating nuclear power plants (FNPPs). It is planned that during the second quarter of 2012, FNPPs will be sent to the Russian far eastern region of Kamchatka. What is the advisability, reliability and safety of this project? The idea of building floating nuclear power plants for civilian use originated in the United States in 1974. The American military establishment built the 10 megawatt FNPP “Sturgis,” which was used between 1967 and 1976 in the Panama Canal during the Vietnam War. That the beginning of the 1980s, the Russian military establishment ordered the Volnolom -3 FNPP projects for use on the Ministry of Defence site on the Arctic Island of Novaya Zemlya. However, work on this NPP was halted in the initial stages. The first civilian FNPP project in Russia originated in the early 1990s. But at this time, Russia was not up to building expensive toys, so realization of the project by 2000 was frozen. In 2001, the project was reanimated, and on August 8, 2006, Rosatom signed a contract with the Sevmash shipyard for the construction of an FNPP. However, a conflict over the cost of the work arose between Rosatom and Sevmash. Sevmash insisted on increasing the cost of the construction from 9.1 billion roubles ($294 million) to 12 billion roubles. Rosatom did not agree. As a result, Rosatom put the question of transferring the project to the Baltic Shipyard in St. Petersburg to government, and the transfer was made in 2008. At the same time, it was decided that the first FNPP would be built not for the Severodvinsk area, as originally planned, but for the needs of Kamchatka. On June 30, 2010 the Baltic Shipyard held a launch ceremony for the hull of the main floating reactor block of FNPP Akademik Lomonsov (project number 20870). Rosatom head Sergei Kiriyenko, who was present at the launch, said he was sure the “product” would be seen off to Kamchatka. FNPPs relative to low power nuclear power plants. They consist of: A floating energy block (PEB in their Russian abbreviation) with two reactors and two steam turbine installations; coastal equipment for transmitting produced electric and thermal energy to an external grid for allocation of demand. The floating energy block is a flush deck, flat bottomed, non-self propelled vessel of the berth connected type (that is, it fundamental regime of use is long-term location at dockside) with a bypass of the hull that is square cut and with large multilayered bulkheads. 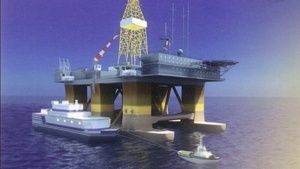 The construction of the body frame of the FNPP is a complex floating construction of 140 metres, a width of 30 metres and a height of 40 metres. An FNPP is a specialized vessel and the engineering of its use envisions practically unlimited use in all oceans of the globe including the arctic. It is important to remember that an FNPP is not just a source of warmth and electrical energy but a concentration of nuclear materials, technology, and radioactive and nuclear waste. The radiological danger is increased several-fold by the fact that the apparatus for reloading the reactors is located onboard a ship. The very process of reloading is a radiologically dangerous technological operation. Radiologically dangerous situations and even nuclear accidents have often arisen during reloading. A specific characteristic of FNPPs is their radiological danger to all personnel. Another problem is that Kamchatka, where the FNPP is headed, is an extremely seismically active area. Nuclear power stations, per recommendations from the International Atomic Energy Agency, must be able to withstand earthquakes of 8 points on the Medvedev-Sponheuer-Karnik 64 scale of seismic intensity. However, for floating plants, the danger is not so much the earthquake itself as its consequences, such as tsunamis, which are characteristic in the Far East. If an FNPP were thrown against the shore in a tsunami, then the working reactors would mean an unavoidable nuclear accident. The decision to situate FNPPs at the nuclear submarine base in Vilyunchinsk is absolutely incomprehensible from an economic point of view. After all, neither Vilyunchinsk nor Kamchatka are in need of an additional 70 megawatts of energy. The single explanation to this strange decision might be that no one in a military garrison will protest the deployment of an FNPP in the waters of a military base. Why would St. Petersburg need an FNPP? Rosatom presents the FNPP construction project as an innovation, however the technology which is used in the reactor installation and in other equipment in the station is actually significantly outmoded, and the technical reliability of the employed equipment is not very high. Today, it remains an open question as to where potentially radioactively dangerous work tied to the construction and launching of FNPPs will take place. This work includes the delivery of nuclear fuel to the floating reactor block, loading the fuel in the reactor, and the physical and energetic start ups of the reactors. The problem is that in the 1990s, a decree of the mayor of St. Petersburg forbade precisely such radioactively dangerous work within the precinct of St. Petersburg, and since that time, such work has not been done either at the Baltic Shipyard or the Admiraleisky Wharf, another major shipbuilding point in the city. The FNPPs that were being actively developed in Russia in the 1990s were suggested to be built with maximum standardization, and as such, released onto the world market. It is considered that because of the small scale of the project, a customer has more control over the expenses. In practice, the cost of the first completed projects skyrocketed from the $150 million declared by Minatom (Rosatom’s successor) in 2001 to $550 million as announced by Rostaom head Kiriyenko in 2010 – more than three times the initial expectations. Of this money, the reactor block itself costs $456.7 million, and the coastal and hydrotechincal equipment $64 million. Small nuclear power installation projects have been imparted a high status, and are financed within the framework of federal target programs, correspondingly, have extremely low demand to economic indicators. For example, the laid out required discount rate is 4.5 percent annually. This is extremely low, and simple calculations show that acceptable rates, at least somewhat approaching commercial rates (for instance, 6 percent) make the project unprofitable. Incidentally, Kiryenko himself plainly announce that the FNPP project only has an economic perspective under one condition: if there are orders for a large series of FNPPs. Who the potential buyers of and investors in these expensive sources of energy is still unclear. The specific problem of FNPPs is that every 10 years (or 12 years according to the engineering documents) they need to go for prophylactic maintenance at dry dock. This involves considerable expense – dock rental, towing and the work itself as well as incidental expenses. Taking this into consideration, FNPPs are one of the most expensive sources of electrical energy. Finally, the wide distribution of FNPPs throughout the world opens a possibility for terrorists and hunters of nuclear materials and technology that the world cannot ignore. I would suggest that readers answer for themselves the question posed in the headline: Does Russia need floating nuclear power plants? Alexander Nikitin is the director of the Environmental Rights Centre, Bellona.